On April 30th 2016, in celebration of International Tabletop Day, I hosted 160 people in downtown Nashville for an all day open board gaming event. Part 01 of this article discusses the planning and strategy that went into my event. Part 02 – Game Day is Upon You covers the days leading up the event and the event day itself. Part 03 (Coming Down Off the Post Event High) talks about ways you can close the books on your board gaming event. Before we go back in time, here’s some numbers that were meaningful for Nashville Tabletop Day. Even though Nashville Tabletop Day was my first full day event, I’ve been running monthly game nights in Nashville for a year and a half. I started off small, hosting 10-15 people at the Eventbrite offices, Emma offices, and various other businesses around town. Slowly word started to spread, and now there are nearly 50 people meeting on the 3rd Thursday of each month to spend time together gaming. I think it would be tough, if not impossible, to dive straight into planning a large event; if for no other reason than you wouldn’t have a built in support mechanism. My friends are my sounding board, my radar (for gaming news), and the core of my marketing team. Plan ahead and grow your local audience first. Then you’ll have a willing group of people who will support your efforts. Once you’ve laid the groundwork for an event, decide what specifically you want to accomplish. In my case I didn’t really think about this too much, which caused some friction closer to the event. I simply wanted to play board games on Tabletop Day. While that’s a fine goal, it proved tough to plan an event around. Next time I do this I’ll make a point of having a specific goal in mind. Perhaps that goal might be a larger number of attendees, or getting specific publishers involved, or some other meaningful metric. Setting a goal makes it easier to determine if your event was successful. One of the most important parts of any event is the venue. It should be centrally located, or at least easy to get to. It needs to have enough space for your attendees, have good parking availability, and needs to be safe and clean. I was fortunate enough to have worked at Emma, Inc. before moving to Eventbrite. So in November of 2015 when I found out the date for Tabletop Day 2016 I immediately contacted my former employer to inquire about the space. Emma has a policy of making this wonderful meeting space, known as The Bistro, available for free to community events. After checking the schedule they committed the space to me, and we had a place to meet. While running my Game Night I thought it would be a good idea to reach out to various publishers to see if they’d be interested in sending games as prizes to be given out at my event. I made a list of some of my favorite publishers, then spent time collecting contact information (website, emails, names, etc.) for each of them. I never ended up sending those emails, but the data I had collected served me in good stead for Nashville Tabletop Day. When I first started gathering this data, I was under the impression that publishers would be thrilled to send games to my group for prizes. I was only thinking of asking for a single game…what could be wrong with that? So with the goal of getting publishers involved I sent out 42 copies of the following email to publishers representing over 60 game companies. My name is Andy Matthews and I run a monthly game night with about 130 members. As an extension of my Game Night I’m going to be running a hosted event on April 30th in celebration of Tabletop Day. I’m hoping for 100-200 attendees throughout the course of the day. I plan on the event running from 9 or 10am in the morning to nearly midnight. I’m also going to promote the event through NAGA (a Nashville game group with 700+ members), local college campuses, and various sponsoring businesses. I’ve also reached out to Geek & Sundry to ask to be included in their list of venues running Tabletop Day events. The NAGA organization will be providing the game library for the event, with about 200-300 titles, as well as librarians and people to run introductory games for newcomers. Additionally I expect people to bring their own games. Would your company be interested in contributing to the to the event’s prize pool in exchange for sponsorship promotions found on all of the marketing material for the event? Let’s pull a few key elements from this email. I identified myself up front and gave my bona fides. Sure the publishers don’t know me, but they can see that I’m not just talking about a small group of friends. I gave context as to why I was contacting them. I gave them details about my event, such as the venue website, and how many people I expected to bring in. I detailed the ways in which I would market the event, and their participation in it. Lastly I asked for their support. Don’t feel like you have to use this exact format, but the elements of this email are important. Game publishers don’t owe you anything, and it’s up to you to convince them to help you. I received responses from almost every publisher on my list ranging from outright “no”s, to enthusiastic “yesses”. Some publishers volunteered to donate games to the library rather than have their games used as prizes. Some publishers only wanted their games used in Play to Win scenarios. Finally, some publishers were so amazingly generous, that I received several boxes weighing 25+ pounds. 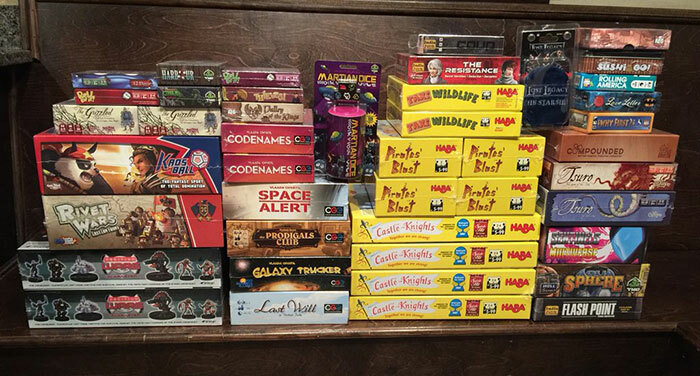 The picture below is ONLY the games which were donated for use as prizes. There was another 10-15 or so games donated to the game library. For the publishers who said “no” to my requests for prizes, I replied back to them to ask if they’d be interested in donating “library copies”. Everyone who was asked that question said yes. All publishers have slightly damaged, or demo, copies laying around their warehouses. Be honest though, and only use those games for their intended purpose. The publisher might never find out if you cheat them, but if they do they’ll never trust you again. Unless you’re a glutton for punishment, or a workaholic, there’s no way you’ll be able to do all of the work for your event on your own. You might be able to organize much of the work up front, but you can’t do it all the day of the event. And while Part 02 will talk about the event day itself, you simply must give yourself time to arrange volunteers well ahead of the event day. Begin by reaching out to the group of friends you’ve been building up. Chances are they’ll be coming to your game day and would love to help you make it a success (but don’t assume). Send emails to other game groups in your area, or college campuses, game stores, etc. Make sure you let people know that if they volunteer they’ll still have a chance to game. You’ll need most of your volunteers at two main times: setup and teardown. Your event might differ slightly depending on venue, but that’s a good place to start. You’ll also need someone to manage your check in desk and your game library checkout desk. Everyone else can either swap in and out, or wander around and make themselves available to help. What’s a board gaming event without board games? I was fortunate enough to have access to a library of almost 400 games through NAGA (Nashville Area Gamers Association). Their mission is simply to promote board gaming in the Nashville area, and they make their library available for anyone to use. Evan and Sarah, the organizers of NAGA are a couple of great people and they truly love gaming of all sorts. I’ll talk more about a game library at the event in Part 02, but suffice to say that if you don’t have a comprehensive library available to you then you’re going to need to rely on people bringing their own games. That’s totally cool because they’ll probably do it anyway. Just make sure that people are aware of this fact and can plan accordingly. A board gaming event without attendees is just sad, heck ANY event without attendees is sad. And the best way to get attendees is to tell them about your event. You can accomplish this in a number of ways: word of mouth from your existing audience, flyers around town, social media, Facebook ads, and local newspapers. All of these are great options and I recommend you evaluate and attempt to use all of them. Step one is to create an online presence for your event. This can range from a single landing page all the way up to a full fledged website. But it should contain all of the basic information a potential attendee would want. Date & time, location, schedule, cost, a reason to attend, etc. You should then use this URL in all of your marketing materials. If the URL is too long, consider using a URL shortener such as goo.gl or bit.ly to make the web address easier to type. Do your best to make the website easy to use. Don’t forget that many people will be looking at it on their mobile devices so it shouldn’t have too many pictures or be too hard to read on mobile devices. There are plenty of websites that will let you create a free online presence, even allowing you to choose mobile optimized templates. If you’re not the creative type, then consider creating an event registration page on a service such as Eventbrite and point all of your marketing towards that. If you go this route make sure to create a short URL (as mentioned previously) as the resulting event URL for online software like this can be quite lengthy. I talk about creating a registration page on Eventbrite later in this article. Make sure to advertise your event to as many social channels as you have available to you. Don’t mention your event every hour on the hour, but once every few days is reasonable. Don’t use the same message every time, but mix it up. Interview attendees, talk about the schedule, post pictures of prizes publishers are sending you, etc. Make sure you post at different times of the day to make sure both early morning and late night readers will find out about it. Use an online tool such as Buffer to allow you to send posts while you’re sleeping with their scheduling feature. Pro tip: tools like Buffer also provide rich analytics so that you can measure the effectiveness of your posts. Just remember to be cool. You’re excited about your event, but your readers want to talk to you, not be talked AT by you. Ad platforms were always a mystery to me. Scheduling, arranging, paying, etc. Those things always seemed so hard, but Facebook Ads make it super easy. 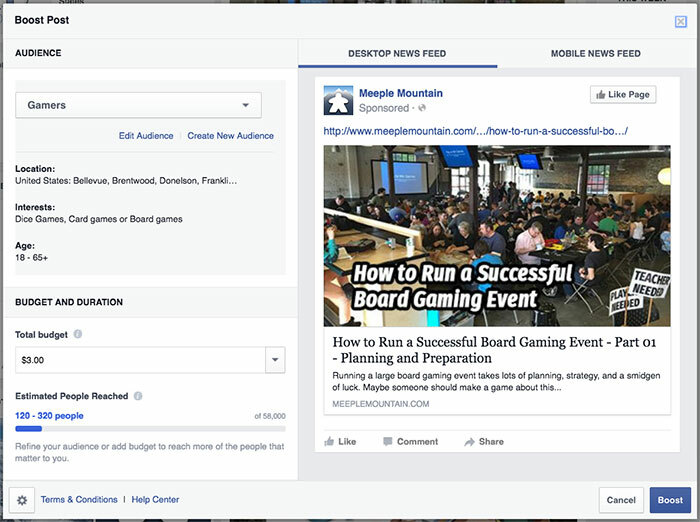 Your first step is to create a Facebook page for your event. This is a little more official than your personal account and will allow you to “Boost” posts from that account to be seen by people outside of your direct sphere of influence. To get started I wrote a post on my website announcing that registration for my event was open. I then linked that post to my Meeple Mountain Facebook page and clicked the “Boost Post” button located underneath the post on Facebook. You’re then taken through an initial setup process. Once you’ve come through the other side, Facebook gives you the ability to configure segments of people whom you think would be most interested in your event. I initially chose to push my post out to people between 18 and 65, who said they liked board gaming, and who lived in states directly adjacent to Tennessee. About a week before the event I trimmed it down to only people in and around Nashville. All total I spent $11.60 on Facebook, which allowed 761 people to see my boosted post, 4 people to click through to my website, 1 to like my post on Facebook, and 15 to like my Facebook page itself. I’ll never really know how effective it was, but it was a good experience and one I’ll definitely experiment with more for future events. Geek & Sundry, the creators of International Tabletop Day, were thoughtful enough to make their marketing materials available for download about 2-3 weeks before the event. They provided templates that organizers could use to print flyers and posters. I was able to find a volunteer who took their materials and turned out a final poster that included sponsor logos and specific information about my event. I then went around town to local college campuses, various sponsoring businesses, and any other business who I thought might be willing to post flyers. Local game stores, book stores, record stores are all great possibilities. One problem with printed material is that without lots of preplanning there’s no way to track effectiveness. For my use case I will most likely not bother with flyers next time. Knowing your audience is the most important part of marketing. What sites do your attendees visit, etc. Do your best to put a link to your website in as many relevant websites as possible. Not only will those links garner short term support, but the longer they’re out there the more likely people will be to see it later on. Probably the single most important means of communication, especially in tight knit communities like board gamers, is word of mouth. Start telling your friends, and their friends, about your event as soon as you have the date and time. The further out you tell them, the further the Six Degrees of Separation factor will have time to come into play. I also reached out to 2 local game stores and told them about my event. I know I received at least a few attendees as a result of that connection. Your mileage may vary. One of the biggest drivers from online sources was a link from the Tabletop Day website, where users can submit their own community events. If you’re doing a Tabletop Day event like mine, then add your event as soon as you know the details. Don’t expect much traffic ahead of time…most of my traffic from their website came in the week before the event. Look for local websites who collect and list events in your city. Now Playing Nashville was a good driver of traffic as well. The Nashville Scene (a local “alternative” newspaper), and The Tennessean (our primary newspaper) both had ways for users to submit events for consideration. I emailed both papers, as well as local TV stations, with information about Nashville Tabletop Day but never heard back. So I simply drove to both their offices in person to follow up. Local colleges and universities are also great places to submit your event. What college student would pass up the chance to get off campus for a day and get free food? No. Brainer. If you plan on having more than 15 or 20 people for your event, especially if some of those people are unknown to you, then creating a place where people can register for your event is a fantastic idea. Online event planning tools such as Eventbrite make it super easy. Plus if your event is free, like mine was, then it won’t cost you a thing. Would you like to sign up for a Pandemic Survival Tournament? This allowed me to schedule more volunteers during heavier times of the day, plan for how much food to order, and allowed my volunteer running the Pandemic tournament to plan accordingly. Because Eventbrite has been around for so long I was able to take advantage of their online reputation. This helped my event show up in Google MUCH faster. 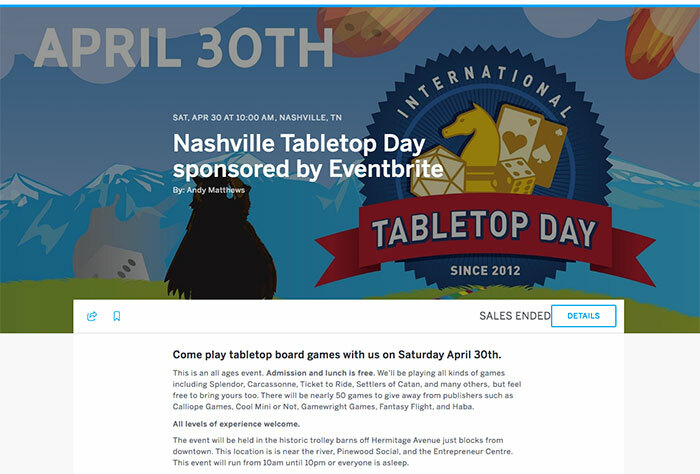 For example, a search for Nashville Tabletop Day returns the Eventbrite registration page in the number 3 spot ahead of this very website talking about it. Eventbrite gives you the ability to email your attendees, run reports on how people found your event, manage a waitlist if you sell out, and much more. Even if you don’t end up using Eventbrite, it’s worth a look at their offerings for future events. Finally Eventbrite has mobile apps for both iOS and Android that let you manage the checkin process. Install it on your phone, a tablet, or some other device and you can manually check people in by finding them in the list of registrants, or even scan the QR code on their ticket. While using the app for Nashville Tabletop Day, it was a delight. Fast, easy to use, and also gave us a real time count of checkins. Not every event offers food, but I wanted Nashville Tabletop Day to be an “end to end” event so that gamers wouldn’t need to leave to eat. My original plan was to reach out to past sponsors of my game night to see if they’d contribute a percentage of the cost of food. In the end Eventbrite stepped up and volunteered to cover the entire cost of food, drinks, and snacks. Hillary, the Eventbrite coordinator, even offered to make the arrangements herself which saved me a lot of time and worry. In the end we had plenty of food for the people who showed up, even having some leftovers that were snacked on for several hours after lunch. I was able to plan for just the right amount of food thanks to asking the “lunch” question in the Eventbrite registration page. If you’re going to be providing food, make sure you offer alternatives based on the meal provided. Gluten free and vegetarian options are a given these days. Account for other attendees accordingly. Asking about dietary restrictions on your event registration page is a great option. A good selection of drinks is also a good idea. Even something as simple as bottled water is handy, but you can go as elaborate as your event requires. All total food, drinks, and snacks for the event cost $760. Even though I had set my max attendees at 200 I didn’t honestly think I’d hit that number. But in the week before the event my registrations skyrocketed, going from around 100 on Monday to sold out on Thursday. Since I wasn’t accounting for that many people I had to scramble and order 10 8 foot tables, and 40 folding chairs. Party rental places in your area will generally have availability for these two necessities all the time. In my case my local rental company charged me $7.50 per table, and $1.25 for chairs, plus a $100 delivery/pickup charge. Make sure to be ready for additional expenses such as this. Note that this might not be an issue depending on your venue. The space where I held Nashville Tabletop Day is primarily configured for presentations and stand up type events, and as such has far more chairs than tables. Rental of tables and chairs cost $271. That’s it for Part 01 of How to Run a Successful Board Gaming Event. Look for Part 02 – Game Day is Upon You in the next few days where I’ll discuss the days leading up the event and the event day itself. In Part 03 (Coming Down Off the Post Event High) I’ll offer some helpful suggestions for thanking your attendees, sponsors, and generally everyone for helping make your event a success.